It was hard to tell, even then, if it was the start of something more for the McCluer North High School senior. But the St. Louis native knew that his 6.82 second facility record for 60 meters at the USATF Galleria Games in December was certainly special. He'd crushed the previous record by 0.11 seconds, at one of the most prestigious early season races in the country. And it felt gooood, with a lean over Hakim Ruffin for the win. But that was merely the beginning of his meteoric rise this indoor track and field season. 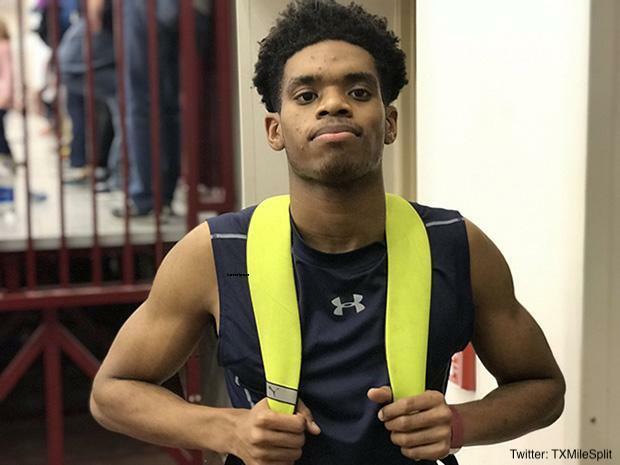 Lang's performances have now put him in the driver's seat heading into the championship section of the 60 meter boys championship at New Balance Nationals Indoor this weekend in New York. While his US No. 1 time of 6.62 seconds is tied for fourth all-time, behind such names as Casey Combest, Anthony Schwartz, Cameron Burrell, and Deworski Odom, there's no guarantee Lang will win. Yet again, he'll have to prove his quality against some of the best sprinters in the country. How did the senior from Florissant, Missouri, go from a promising up-and-comer to one of the frontrunners for a national title in one of the nation's most competitive events? Lang began his track and field career in the eighth grade with the Ultimate Speed Academy, a youth track club out of St. Louis which serves national-level talents such as Brandon Miller, Hasani Barr and Alicia Burnett, among others. Lang originally signed up so he could stay fit for football, but it quickly turned into so much more. He made an immediate impact, as he qualified to the 2015 AAU Junior Olympics in the 100, 200, long jump, and even ran a leg on the club's third-place 4x400 meter relay. Though he didn't place in the sprints and was 12th in the long jump, Lang was able to reflect on his time at the championship meet and came away with a few big realizations: He found the competition, the roar of the crowds, and the experience of earning medals to be the most rewarding. Through hard work and dedication, he believed he could achieve anything he wanted. But Lang wasn't an immediate superstar. He entered high school with solid personal bests--11.81 in the 100, 23.82 in the 200, and 18 feet, 11 inches in the long jump. It wasn't until his sophomore year where he began to break out. That same year, in 2017, he won 12 out of 15 races heading into Missouri's state meet and set new personal bests of 10.63 and 21.59 in the 100m and 200m. He soared up the state leaderboards and cemented his place as one of the favorites for an individual title in both of the short sprints. Then, after not only surviving but dominating the toughest sectional in the state for the sprint events, the sophomore was ready to take home gold in Jefferson City at the Class 5 Championships. On the track at Jefferson City High School, the McCluer North High School star was shining bright. Lang rode a 10.80 second 100 meter prelim into the finals, placing him in Lane 6 as the third seed. He then followed that up with a crushing victory in Heat 2 of the 200, running 21.72 and securing the power position heading into finals. 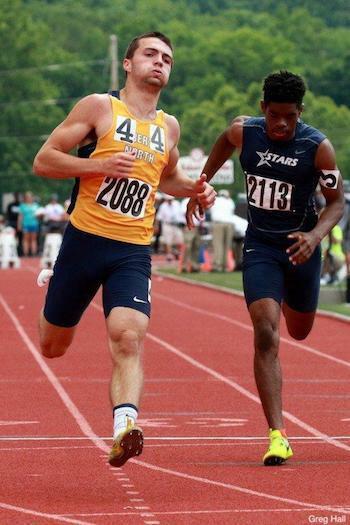 Liberty North's Jon Redmond--now with the US Military Academy--would take the title in both races, but Lang would finish just behind him in the 100m, running a wind-aided 10.80 to take third overall. He would go on to finish behind Redmond again in the 200, but this time come across the line in seventh in 22.89. Third overall in his first trip to the state meet as a sophomore? Lang knew he had two more years left. So what was on deck for this incredibly talented young man, especially considering many of those ahead of him were graduating? But as the 2018 season came into focus, Lang's success had to take a short break, as he succumbed to the injury bug. While preparing for his first indoor campaign following his major breakout, Lang was outside in the brisk Missouri winter practicing sprints when he felt a pull in his hamstring. The sports medicine doctor he visited gave him exercises and instructed him to be careful for the next six weeks. After some careful management, Lang felt prepared to resume his training and begin his outdoor season with McCluer North, but he again felt the pull of his hamstring when practicing block starts. It was the same spot. The hamstring, being a finicky muscle when aggravated, had in fact not fully healed. Lang and his parents went back to the doctor and were instructed to rest and take care of the pain for the next six weeks. Lang was going to have to miss his junior year. "I did...the exercises given from the doctor and prayed," Lang said. "I felt like I was in a dark room with no light," he said. Unfortunately, many (not all, but many) Missouri track fans had all but forgotten about Lance Lang. With the emergence of Justin Robinson, Jameson Williams, Courtney Watkins, and several other national-caliber sprinting talents, Lang's injury had pushed him into the shadows. But in December, in his first race in over 18 months, he returned at the USATF Galleria Games with that 6.82 second 60m run, a US No. 1 at the time. He pushed the envelope even more as the winter wore on and soon was back on the radar in a big way. 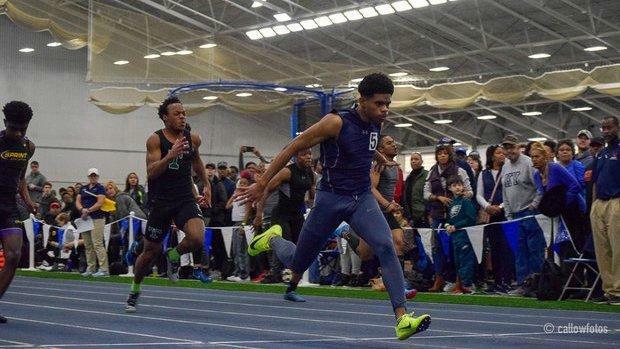 Lang followed that up with two 60m efforts at Texas A&M High School Classic three weeks later, but it was his 21.81 in the 200m that became a US No. 9 mark and was his first attempt at the distance since May of 2017. His third and most recent meet of the indoor season provided all the evidence we needed that Lang is one of the best short sprinters in the country. Matching up against such talents as Marcellus Moore, Langston Jackson, and Robinson, among others, Lang wasted no time running the fastest time out of prelims and dropping a tenth of as second in the process, going 6.72. Later that day, he set the track ablaze with his 6.62, recording the No.4 all-time mark and just holding off Moore's late charge. It was a clinic of epic proportions as Lang shot out of the blocks, established a lead almost instantly, and drove all the way through the finish line. He was hardly finished, though, as he threw down a US No. 6 time of 21.21 in the 200 as well, a lifetime best by nearly four tenths of a second. In his first indoor season, Lang has made a significant impact already, running incredible personal bests and setting all eyes on him heading into the New Balance Nationals Indoor. "This is my first time ever doing indoor and it was a blast!" he said. "I enjoy being a circuit runner and competing with different athletes on different tracks." Lang is no longer running as a member of the track team at McCluer North High School. This was a decision he made as a result of some introspection. But soon, after some lucky happenstance on social media, Lang was able to connect with Indianapolis personal coach Jeff Williams. "My mother found him on Instagram," Lang says. "She was impressed [with] how knowledgeable he was about the body. [She] decided to reach out to Coach Jeff...and asked if we could come visit with him and he [agreed]." "I'm so happy to have coach Jeff as my mentor, my friend, and my coach," Lang added. "Jeff is highly intelligent, understanding, and he listens, but what's so impressive to me is before we discuss anything about track and field he always asks how I'm feeling, how was my day, and how was school. I can contact Coach Jeff any time of the day and he will answer his phone and always be pleasant when he answers." Lang visits Williams every three weeks for personal coaching, but has to train on his own with workouts he receives with the help of his parents and older brother, Quentin Thompson. "Training is long for me. I have to change a little at a time to improve my craft," Lang said. "If I want to improve, I have to stay focused." Lang is looking forward to his first experience at the New Balance Nationals Indoor. As the top seed at 60 meters, he will have to fend off several of the top talents in the country in his quest to bring a national title home to Missouri. "[My goal is] just to go out there, and run my race," Lang said. "Execute the best that I can and have fun." Lining up against him will be six of the seven next fastest athletes, including a revenge-seeking Moore and others. Moore isn't the only athlete Lang has to worry about, either. There's Benson (OR)'s Micah Williams (US No. 3), Fairfield Prep (CT)'s Bryan Santos (US No. 4), Jackson (US No. 5), and DeMatha Catholic (MD)'s Nick Cross (US No. 7), too. It's the kind of matchup for which national meets are made and qualifying for the finals will be on everyone's radar as the prelims and semi-finals unfold. Looking beyond the national meet, however, the outdoor season has become a little more murky for the senior. He will have to find meets to compete in outside of the Missouri High School Athletic Association. "[The plan for] outdoor season is to run one or two races a month, get faster, and stay healthy," he said. While Lang isn't sure what meets he will be competing in just yet, he wants to seek out the best competition as he attempts to continue the impressive breakthrough he enjoyed this winter. Though he won't be competing on the Missouri outdoor circuit any longer, Lang says has nothing but good things to say about the state of track and field in Missouri. Looking even further, he says he's enjoyed considerable attention from several of the top college programs. According to his Instagram page, coaches from the University of Tennessee, the University of Auburn andthe University of Kentucky have taken personal visits to see him. While he has yet to make a decision on his school choice, he has noted that "every one from my mom, sister, father, and I have a top 5" and "I'm still hearing everybody out." Wherever Lang lands, and however he closes out his indoor campaign, rest assured he's definitely here to stay. This may only the beginning to an illustrious sprint career for the St. Louis native.